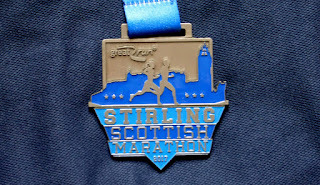 As regular readers will know I have not really been looking forward to Stirling Marathon. Partly because of insufficient training and partly because I don't like road marathons. (One leads to the other.) They used to be my worst distance and not much has changed except a PB in Edinburgh in 2014 (2.50) at the age of 51. 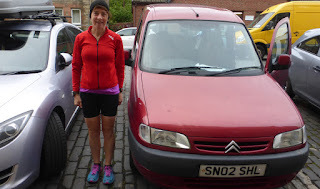 That aside my marathon career has been poor and several years can pass without doing one. And most times I do one I wonder why. I'm not quite as bad as a couple of hillrunners I could name who sign up for one (London frinstance) and then completely neglect training and do a time that is nowhere near their potential. Fergus and Jim, you know who I mean? If I had been aware of the timescale for this one I might have baulked. We had to leave the house at 6.45am and that was Mary's best offer. Had to be in Stirling car park for 8.15. (9am start.) I had had a taxing week painting outdoors which is always tougher than indoors. On Monday I ate my sandwiches in the light drizzle. I did manage a more deliberate taper than usual, only running once at club on Wednesday, and missing intervals on Thurs. So I was reasonably fresh. But recent timed runs suggested not sufficient shape to go sub3, something I'd like to do before retiring from road mara-torture. Meanwhile we get to a mile and a quarter before junction 10 and grind to a halt. There is a huge queue of traffic and we progress towards the Prudential car park at walking pace. Slowest mile of the day. 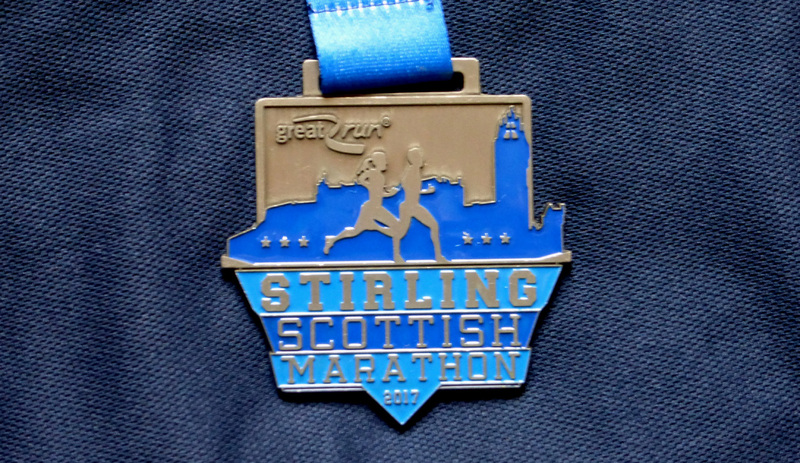 We assume someone on a radio is informing the organisers and they will delay the start or let us start (chip timed) late. But it does fill us with dread. Another runner 2 cars ahead gets out and pees behind a motorway tree before running up the road to rejoin his colleagues. That's how slow we are going. We arrive at the Prudential Car Park 30 mins later and are badly directed by marshals to random spots without reason. Out the car and running, finally we join the long bus queue and can relax. The bus leaves around 8.30 but only takes minutes to drop us outside Blair Drummond Safari Park. We walk more than a mile to the start area (why didn't the buses drive this?) where I got in a huge queue for the portaloos, then realised the race was going to start in 2 minutes, peed behind a tree (nearby squatting ladies and standing men) then ran to the yellow striped zone where nobody was because they had already made their way to the race start arch. The orange starters were there but no sign of my yellow peer group so I made my way to the front by climbing over a fence and back, then had only enough time to re-tie one lace (other one had to go without) before Brendan retiral-fund Foster set us off. After seeing friends post photos of penguins and tigers and otters I regret not getting up an hour earlier, or booking accommodation in Stirling. The first mile I dodged between some slower runners (said hello to Robert M) and got ahead of Liz McColgan judging by the shouts of spectators. I had looked at a pace calculator last night to see what pace to run at. I reckoned for a 1.27 half and a 2.59.20 full. Which meant 6.37 pace until 20 miles then 7.15 ish to the end, or death which ever came first. The first mile I knocked out in 6.37 according to my watch (6.40 says Mr Suunto.) 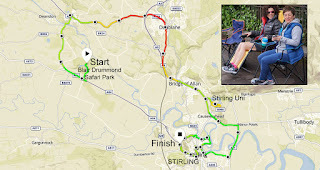 Followed by another 10 miles of similar until the up hill mile between Bridge of Allan and Stirling Uni which I knocked out in 7.11 but I remember it hurt and I staggered round the Uni grounds gasping for breath unable to appreciate the birdsong and trees Mary spoke fondly of: her old university. 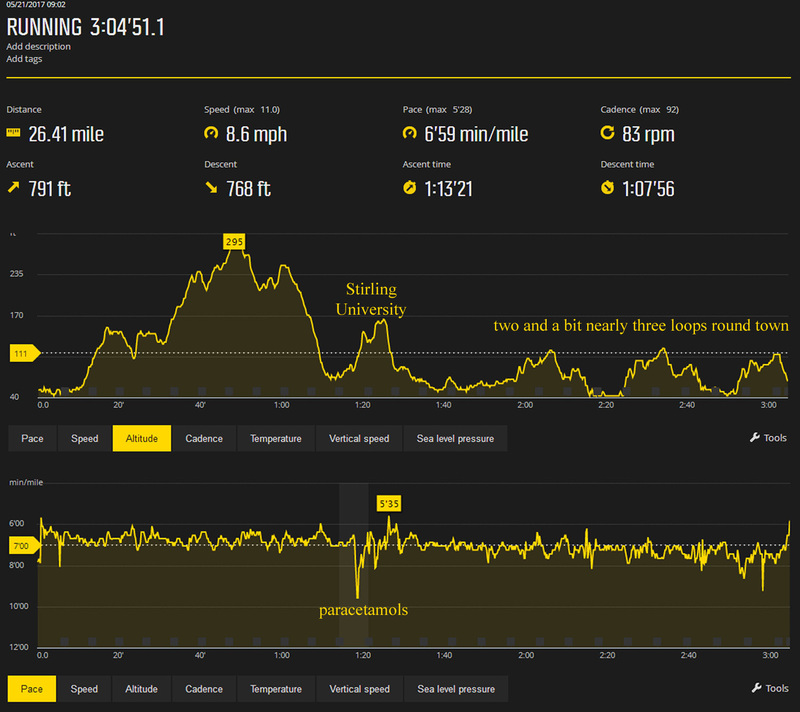 Talking of hills, check out the altitude profile and all that lumpy stuff up till then. I did not enjoy any of it. Well maybe I felt comfortable over the first 5 but from then on I was fighting. Which is not ideal for a 26 mile race. Julia was cheering on at Bridge of Allan and taking photos. She asked where the Porty vest was. 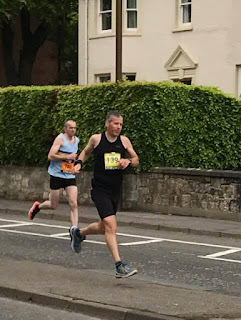 I resisted the long answer – I need a new vest and the current one is a long way from comfortable (or good fit) and I was trying to run in stealth mode black – so instead I cursed a bit about how I had forgotten what an ugly business this marathon thing is. I was hurting pretty bad from 8 miles in, a sure sign I had started too fast and wouldn't be doing sub3. Although this gives you plenty of time to get used to wearing the crown of shame it is far from a pleasant way to run. I hit my 5 mile target (33mins) spot on and was only 1 min over at ten miles (67mins). However when we got to the University campus I was in such a bad way (12~13miles) I raked in my pockets and gubbed 3 paracetamols. Crunching them down with a sip of bottled water. I hated taking 2 sips from a bottle and then tossing it but the chances of handing a (used) bottle to a marshal and saying “recycle please” and them realising I was condensing the idea that a used bottle might be a preferred option to no bottle if the back runners ran out of water, was slim to none. So I tossed nearly full bottles into waiting bins. So wasteful. I pocketed my used gel wrappers. Mary and I both had gel problems. We exited the car so quickly I didn't notice my gels (2 of 3) had slipped out my shorts pocket and were lounging on the car seat. Mary had one spare to give me. She then dropped hers out her vest pockets when crouched in the trees in the safari park. But we found those after a quick search. So I had one normal gel at 10 miles and one caffeine at 13 miles. I have found that a small can of energy drink around 15 miles works wonders. However there were no drop bags or handy folk at 15 to pass me this, so I did without. I may or may not have had additional painkillers, but can't mention this to Nurse Hunter or she will take away my Boots loyalty card and put me on suicide watch. I have to report all pain was not banished. And then around halfway the skies opened and a heavy drizzle fell, sweeping salty oil out my hair and down my face. I passed a mile or 2 wiping this off my forehead and into my eyes. 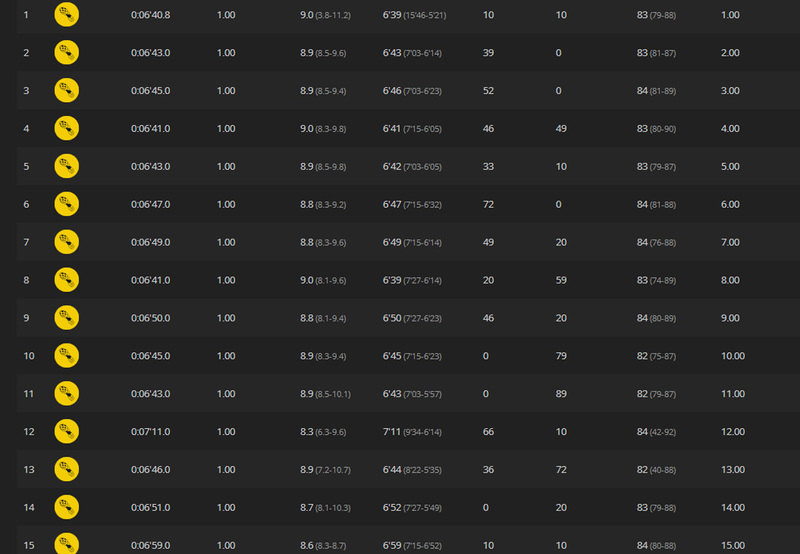 I think I was still watching my Suunto for pace but was fairly sure things were doomed. There were several (3?) tables with Isotonic drinks. Zero cal Isotonic drinks. Mary had been anticipating Lucozade. I hadn't read the info sheets so wasn't expecting anything other than water and a thin smile. I think there was also a repair station for vaseline, reassuring words, blister plasters and tough love. 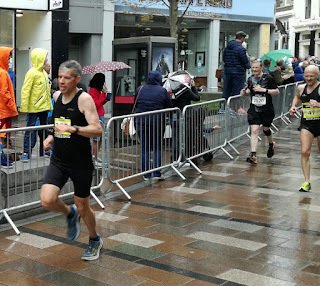 For most of the race I was looking forward to the long awaited moment when I could stop running and (with an hour to kill before Mary arrived) maybe have a lie down and 40 winks on the backseat upstairs of a baggage bus, wrapped in discarded silver blankets. At one point I overtook someone running in a charity shirt that said something about running for blood cancer. I took a moment to count my blessings. Some folk are travelling through this world with incurable illnesses and a terminal prognosis and here am I feeling sorry myself because I couldn't be arsed training properly for a relatively meaningless time in a relatively inconsequential race. However pretty quickly I got past him and returned to stewing in my own juice. Yes that's boring. I have been spoilt by running many fantastic miles round beautiful coasts, over glorious hills, along lovely riverside trails. I didn't even see him on the loop through town. Around mile 18 things changed. Someone, to make up the distance, had devised 3 loops round Stirling town centre. So at mile 18 there was a big sign saying 21 miles. You followed the road into town past cheering crowds, over cobbles (how are you getting on with those minimal shoes?) and through quite narrow streets lined with cheering crowds. I had been looking forward to this as it heralded the beginning of the end. Not super keen on the regular rises round corners and sudden downs and ups where the path dodged through underpasses, but first time round it wasn't bad. Up the road where I said the same bad word twice to Willie J taking photos, because it was the only word I could think of that adequately summed up my entire race in four letters. He said encouraging stuff and soon I was approaching the gantry for the first time. There was a recorded message telling us to go through on the right after the first 2 laps and on the left after the 3rd although this wasn't another lap – just the finishing 200 yards. I had read we were doing laps and thought that's going to end in tears, as folk, braindead from exhaustion blindly follow the person ahead round the wrong way. In reality it seemed to work ok. 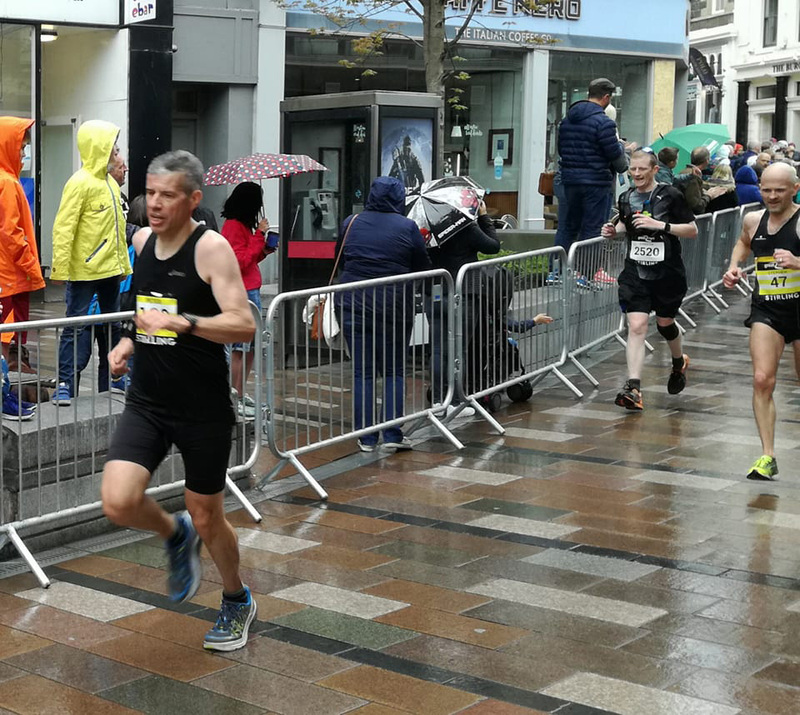 However the thing I hadn't anticipated, and was much less fun, was having to navigate round (on lap 2) the lap 1 runners who are 3+ miles behind and travelling much slower. On lap 2, I overtook Dr Jones (lap1) and said hello. “How are you behind me?” he asked, wrong, twice. I was ahead of him having just overtaken and I was also ahead by 3 miles. Now if a Doctor can write such an erroneous prescription due to fatigue, what chance do the rest of us have? Either my caffeine gel was kicking in or I just wanted to get this video nasty finished, and I pushed on, keen not to fall into the pace of those on lap 1 ahead who were definitely in a different gear. This meant dodging around them. Where the path narrowed at the underpasses and in town you had to take the less optimum line as the best line was choc-full-of-nuts. Normally running is a non-contact sport but there was one moment when I was overtaking a lady who was moving over to grab a drink from a water table and I swung her outstretched arm back, like closing a gate, and squeezed through before she had the time to call me all the names I deserved. Going through the town a woman jumped out the crowd onto the road to force me to hi-5. I was in such a distant land I didn't realise it was Sandra. Only later I thought it did look a bit like Sandra (out cheering Ian and everyone) though I didn't recognise her in non-running kit. I asked her on facebook and sure enough she said she had to shout to get my attention! Thanks Sandra! I think? I am not a big fan of crowds and noisy races. While dodging around slower runners was not what you'd always want between 18 and 26 miles it did quite a lot to distract and absorb the flagging mental capacities. And after the first lap you knew exactly what to expect for the second lap. Often the last few miles of a long event stretch out into an infinite jigsaw of misery. But knowing what was coming gave me hope. Next time I see that gantry I'll be going down the left lane in search of backseat bus. I had noticed the time when I passed the gantry on lap one and some lucky chap had been finishing, cruising in at 2.36, nice for some. I hadn't looked at my watch for a while as there seemed nothing to be gained except emotional pain to match the physical. I eventually crossed the line at 3.04.43. Funnily enough I asked myself a day or 2 ago what was the most likely time I'd do and 3.05 was the estimate. I wish I was as accurate at estimating how long it would take to paint your lounge. 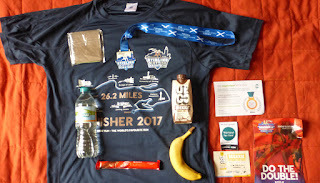 Collected a mixed value goody bag (best things: banana, milk shake, and chocolate, middling things: ok medal, nice t-shirt but all sizes 3 sizes too big you IDIOTS, worst thing: fliers and litter.) If you went to the beer tent you got a free small can of beer normal price £1. And a pint of same in plastic glass for £4. I traded my backseat snooze for those. Roly told me about his blisters and David A scowled across the line, not a happy man. Quite a few folk had had tough days. I wasn't sure whether it was poor training or just trying to go faster than I was capable that made my run unpleasant. Or maybe I've just had it with this kind of entertainment. 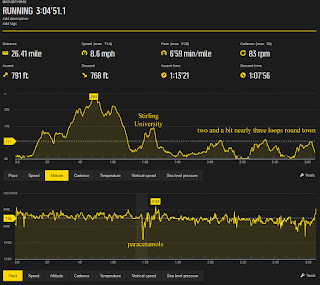 It was possible to have a great run ™ as Martin (Marathon Man) Devine proved, knocking out 2.52. Congrats to him. He said it just all came together including the rain which he enjoyed. Yes, I know, perverse! My highlight of the day was beating Liz McColgan (3.18) AND Zola Bud (3.12). Both younger than me. (Mind you, I haven't pushed 5 kids out my hoo-ha.) I have filed their scalps away in my better-runners-than-me-I-have-beaten folder. Steve Cram is only half in there because it wasn't the same year he ran his Keilder Marathon that I trashed his time, but let's face it, he is past his sell-by-date. And Brendan can go in there because he is too fat to make the start line which means I win fatty, even though you have my overpriced entry fee. (Actually Mary may have paid me in for this one.) And the other highlight was Mary having a unexpectedly good race. She finished in 3.55 a time she hadn't felt she might do and was really pleased. 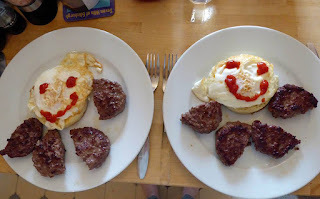 The photo of our post-mara lunches at the top of the page, posted alongside M's result nearly went viral on facebook with so many people "liking" it. 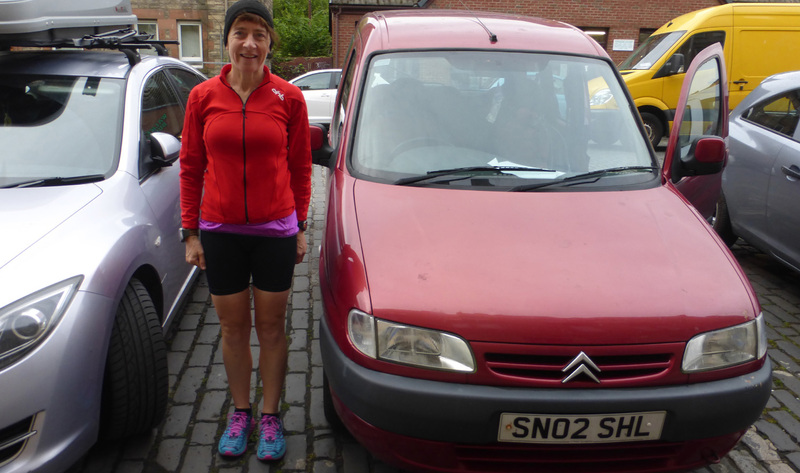 After a few years of pws at every race it is brilliant to see Mary come away from an event full of the joys. Her blog here. Lowlight of the day was the very long walk to the baggage bus then back to the taxi bus. Nobody wants a long hike in the rain in wet shorts and soaking vest, that is the point of having baggage vehicles. And the traffic jam at junction 10 was bad but not really the fault of the organisers. Although if they are looking for tips to make the race nicer for me they could start it later in the day (9am is early if one is travelling from say England, or even Dunbar.) And the route? Well maybe flatter, more scenic, and dump the laps. For a first attempt though, pretty good. Most of the stuff worked and I'm just grouching about the small stuff. Although come on with the extra large medium shirts. I might paint in mine but more likely I'll clean my bike with it. Haha, I could tell that wasn't a happy face when you passed �� I watched in a bit of horror as the lead bike tried to weave through crowds past us with Lemoncello trying not to run into folk, must've been fairly annoying ! Knives you say, stainless steel? 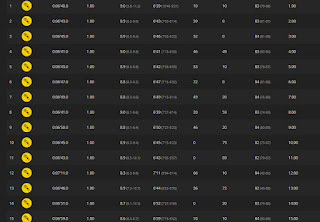 Wow yes I'm going to buy all my knives from now on from someone who advertises knives by spamming strangers' webposts with knives in the comments section of marathon blogs. That is going to make you a fortune Tushar, because that is magnificent thinking and those knives, well they are going to be just as sharp as that idea of yours. I bet you are already driving a big silver car in the shape of a knife, cutting through the traffic like a ... like a... I just can't think of anything that cuts, Tushar. Perhaps with your massive brain Tushar, you can help?